One of the most effective ways to empower disadvantaged young people is to give them access to the same educational resources that are available in the developed world. 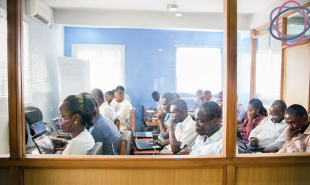 Which is exactly what Andela is doing — the global talent accelerator provides paid training and mentorship to promising young people in Africa, before linking them up with companies around the world in need of remote developers. Companies in need of developers can employ Andela developers at roughly half the cost of comparable workers elsewhere, in the knowledge that they are still being fairly recompensed. They work within the companies business hours and are supported by senior Andela developers. Andela, which is based in New York, gives promising young people in Africa a chance to earn a living in a rapidly growing industry without requiring them to leave their country — and in doing so helps to improve the local economy. Could this scheme work elsewhere?